Gather parts from the gacha and customize your own original machine. Win a variety of races and aim for the top of the Grand Prix! Race, acquire new parts to upgrade your car from the gacha machine, and win to advance through the ranks in the Grand Prix. Can you become the champion? Gain a never ending stream of new parts for your car. Fuse old parts together to constantly improve. Compete for the best time in each course. In addition to the normal Time Attack, there are Time Attack events where you can get special parts for your car. Your time can be submitted online to compete against the world. Do you have what it takes to win against your rivals worldwide? Race against your friends with up to four players! Enjoy exciting races anywhere at anytime, both offline and online! Enjoy some diversions with friends, like the Mini GP race, playable with unusual controls or Car Battle where you use spin attack to knock your opponents off from the square shaped stage. Build your dream race car to your exact specifications! With over 700 parts to work with, the possibilities are endless. Gotcha Racing 2nd Races onto PlayStation 4 and Steam! 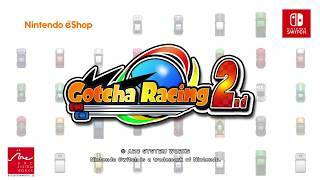 Gotcha Racing 2nd Drifts onto the Nintendo Switch Today!